Preparation time: 10 minutes. Baking time: 50–60 minutes. Preheat oven to 325°F. In a large bowl, combine the dry milk and sugar. Add the liquid milk, egg, egg white, and vanilla, mixing well. 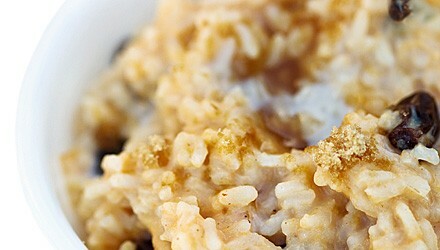 Stir in the rice, raisins, and dried apples. Spray a 6-cup casserole dish with vegetable cooking spray and pour the egg and rice mixture into the dish. Sprinkle top with cinnamon and nutmeg. Bake the pudding for 15 minutes. Stir and continue baking for another 35 to 45 minutes until the milk is absorbed. Serve warm or chilled for dessert or for a breakfast treat with fruit. Exchanges per serving: 1 starch, 1 milk. Carbohydrate choices: 2.